urance and other financial funds for those who worked in his steel mills. In 1901 Carnegie Steel merged with the U.S. Steel Corporation and Carnegie sold out to J.P. Morgan for $480 million, making Carnegie the richest man in the world. He then used his money to further public education, build libraries and lobby for international peace. Once Carnegie reached the $480 million mark, he decided he had accumulated enough wealth and that it was time to “give back.” Therefore, he set about the business of philanthropy just as passionately as he had set out to accumulate wealth. What got me thinking about the connection between Carnegie’s autobiography and Seth Godin’s “Poke the Box,” his latest book on building a lifestyle of creating and collaborating, is the simple clarity Godin and Carnegie both have about creating new things and new opportunities. I am sure there are thousands of coaches out there who, if they could share one wish they have for their clients, it would be to give them unlimited confidence to move them closer to their yet unachieved goals and unrealized dreams. What makes any of us hesitate? What makes us not believe enough in ourselves to even give ourselves permission to try? Why don’t we know that, no matter what, each of us has at least one if not more gifts to share? 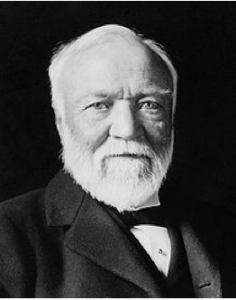 Andrew Carnegie came to the U.S. as a small boy back in the 1840’s. His family lived in a tiny, crowded New York apartment. His father worked in a nearby factory with his uncle. His mother took in ironing and Andrew began working as a messenger boy before the age of 12 to help his family cover their monthly expenses . Andrew started his work life with a strong commitment What do you have to share? If not now . . . when? Poke the Box!